Meal preparation will take more time on the Daniel Fast since most of the foods will be homemade. 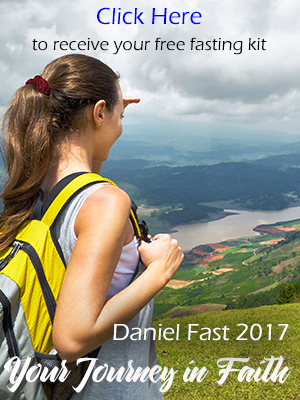 A practice I do throughout the year and works well during the Daniel Fast is to establish a day when I prepare several meals for the coming week. Saturday works best for me. I plan my menus and grocery shopping list at the same time. Then after my shopping is complete, I come home and wash and trim all my fresh vegetables. I slice and dice and store vegetables to be used later in the week for lunches and salads. I make double batches of soups, stews and casseroles. And I try to prepare the time consuming recipes that I would otherwise not have time to make on busier weekdays. While preparing the meals I listen to uplifting music or by audio Bible. It’s a very fun, creative and energizing time. The time I invest on this meal preparation day pays major dividends later in the week when I can prepare a salad in less than five minutes and when I have lunches already portioned out in individual servings that can just be popped in a bag to be eaten later at the office or at school. This is also a nice time to involve the family as they can help to make meals, visit the cook, or pack lunches! If you have never done this, you will be surprised at how much time and money you will save! We advise 3 moderate meals per day with 2 small snacks. How many meals do we eat doing the day? Your Health is Your Wealth. . and am looking forward to starting my fast on Monday and will be sharing it with my church. New Testament church of God. Handsworth. . Yes, the Daniel Fast is appropriate for Lent. Plant based protein powder in a fruit/veggie smoothie is a great way to get added protein. Also, your concerns regarding possible muscle loss: If you are not accustomed to recognizing plant based proteins then you do need to know how to be intentional with protein rich foods. Which are all Nuts and Peanut butter (any nut butter), Whole grains, Legumes and Leafy Dark Green Vegetables, to learn more go to: http://vegetarian.about.com/od/healthnutrition/tp/protein.htm I hope this helps, Be Blessed on your journey! Is this fast appropriate for the 40 days of Lent? Can it be supplemented with a water based protein smoothie? While it definitely has spiritual value, and weight loss may occur too, I wonder about muscle loss . Yes you can. Be Blessed! Can i use tap water to cook my food? i think that saturday is the best too. btw i think your post is informative. That isn’t really part of the Daniel Fast. We focus on the dietary parts. The reason Daniel did not anoint himself with oil is because it was a sign of mourning. So it’s really up to you . . . if you feel led to add this discipline to your fast, then I am sure the Lord will honor it. Pray about it and see how the Lord directs you. Thanks for the question. Blessings to you on your fast. It is mentioned in the scriptures that Daniel did not anoint himself with oil during his fast. Am I to understand that I need to refrain from using body oil or moisturizer after taking a shower? Ezekiel Bread is NOT ALLOWED on the the Daniel Fast for three reasons, first, it’s bread all of which are not allowedl Second, it has honey in the recipe and third, it has yeast. So while Ezekiel Bread is very healthy and made from spouted wheat, it is still inconsistant with the fasting guiedlines. What is your comment on ” Ezekiel Bread, cinnamon raisin” for fasting?